BenjaminFranklin is a Legacy Library. Legacy libraries are the personal libraries of famous readers, entered by LibraryThing members from the Legacy Libraries group. » Benjamin Franklin's legacy profile. BenjaminFranklin is also an author. 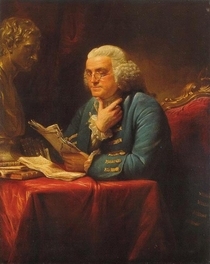 » See Benjamin Franklin's author page. About meBenjamin Franklin (17 January 1706 – 17 April 1790), Pennsylvania printer, author, inventor, ambassador, scientist, statesman, abolitionist. Signer of the Declaration of Independence and the Constitution, a founder of the Library Company of Philadelphia and of the first fire department in Pennsylvania, among many other accomplishments. About my libraryFranklin's extensive library is documented in Edwin Wolf 2nd and Kevin J. Hayes, The Library of Benjamin Franklin. Philadelphia: American Philosophical Society and Library Company of Philadelphia, 2006 (available digitally here) and used to create this LT catalog with the permission of the author and the publishers (American Philosophical Society, Library Company of Philadelphia). A complete introduction to Franklin's library, including information on the travels taken by the books following Franklin's death, is in Wolf and Hayes, pp. 3-56. Wolf and Hayes have created extensive annotations for the titles in Franklin's library; those are included in the Comments field for each record in Franklin's LT catalog. Elements generally provided include the catalog number, format, binding, signatures and marginalia (including Franklin's own shelfmarks), detailed provenance information, and the current location of Franklin's copy, if known. A list of the institutional abbreviations used in the book is available here. Further abbreviations, usually for sources, are in Wolf and Hayes, pp. 875-880. Where the present location of Franklin's copy is known, the catalog number (Wolf and Hayes _) will be followed by an asterisk in parentheses. Where the edition or work is unclear, the catalog number will be followed by a question mark in parentheses. Reviews: Franklin's reviews have been taken from the Wolf and Hayes annotations, and are usually drawn from either Franklin's correspondence or his Autobiography. Tags: Wolf and Hayes provide subject-based tag information for most titles, which are included here with minor adjustments as necessary. Where no tags were included, similar tags were added.